I have a new entry in my top three MTB photog list. Camilla Stoddart is a ruler. Watch out world. Basically put she is a photog with a ski photog background that has decided to enjoy the benefits of summer for once (nine years back to back winters anyone?) which includes exploring MTB photography. She comes with a fresh view and a very keen eye. check out her web page HERE or her Blog HERE (where you can check out some cheeky previews of the shots she got at Stoney Hills at the weeeknd). Yesterday I dragged KELLY “MCMASSIVE” MCGARRY (who has frantically updating his blog with his NZ exploits. Go check it), Swiss ripper Ramon Munziker and Camilla out to a secret spot I have been sitting on for a while. I’ve tried sending numerous peeps, photogs, film crews and riders there in the past but none of them took the bait. Their lose. The place is epic. We had a good afternoon scoping then waited for golden light only to be foiled with sporadic light due to incoming storms. We came away knowing we have to return and hoping next time we could get some bangers. Then this morning Camilla sends me some shots and my chin hit the floor. WOW!!! I wish I could put some images with this post but you’ll just have to look out elsewhere for them. Welcome to mountain biking Camilla. Please stay and have a drink with us because your shots make me want to party hard. 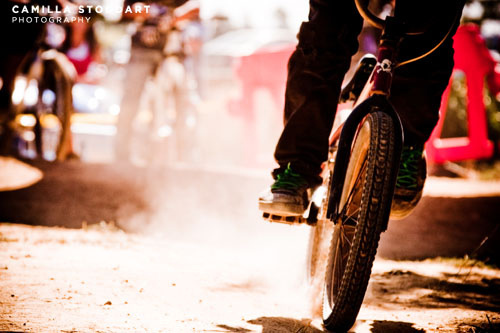 March 2, 2010 in DIRT MAGAZINE, N-ZHRED. Couldn’t agree more…Camilla is a true star. Was staying with her that weekend…she leaves for a night and comes back with the most insane creative footage!